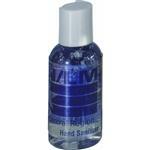 Custom tinted hand sanitizer is a new addition to our promotional hand sanitizers. 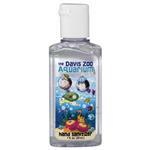 Tinted in your choice of either Blue, Green, Orange, Red or yellow this antibacterial gel provides protection from germs that can get you sick. Comes in Citrus Breeze, Coconut & Unscented. The 1 oz. size makes it convienent to carry anywhere. A great tradshow giveaway for all that hand shaking! Customize with your logo or design. Also great for medical events or even personal care businesses or gyms. 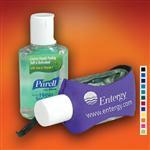 Choose scent from citrus breeze, coconut or unscented to make it a promotional product anyone would love to have. Production Times Available: 5 days, Add 2 days if paper proof is requested. Rush Available. 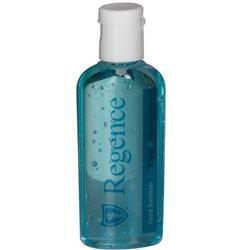 Dimensions: 1 oz bottle hand sanitizer. Typical Imprint Area(s): 1 1/4" x 7/8"
Available Imprint Options: Full Color Process. Pad printing available. Custom hand sanitizer. Tinited. Oval bottle. Citrus Breeze, Coconut & Unscented, White Label Standard - clear label must be requested on purchase order.